Yes - you have come to the right place for the like you were there experience. Pictures from here & there, close-up and whole room. The media has not covered this in a way that most people would want and to be informed by. So, citizen reporter Donald Barber to the rescue! I even wore the Friends of Mayor McCallion sticker - Ha, no one will know who I am. They were handing out and collecting petition slips to try and end the Judicial Inquiry but the wording is questionable. It calls for the Councillors "to do the right thing", those who voted for the Judicial Inquiry made it very clear they ARE doing the right thing. Have to really spell it out and not send mixed messages when dealing with politicians. "Friends of Hazel" Rally. MYTHissauga's Use of Children to Oppose the Judicial Inquiry. Interviews before things start. Mr. Shipp is handing out his own material to media. At the Mississauga Convention Centre, there are 3 main rooms, 2 were used for this event. It was a dark and stormy night, in Dec. Not a good start to any story. How many people really showed up? Good question. As a person who has attend many public meetings and even held a few there are a couple of rules - first, better a small room and full it then a large room and have the number of people feel like the room is haft empty. Second, bad weather, bad turn out. Sun is going down around 5 pm and this event was 7:30, it started to rain around 6 and kept on till even after the event, 10 pm. So rush hour traffic was a mess and driving not what people wanted to do. Some people would come late and leave early. The rooms were not completely filled and far fewer chairs were put out then there were people. I called ahead of time and asked how many people are expected and told the hall could hold 1,000 - officially. Now the media made point of not showing the room or crowd - interesting. The Mississauga News said 300+ showed up, which I e-mailed to say was way low. I later sent some picture for them to use free and was turned down! The pro-Hazel Toronto Sun said 500, still low. Why such low numbers? So far not one involved in the event has said how many were there. Any ways - over the course of the event I would say 1,000 attended, some say more but when you start to count the faces or chairs, the you can see how few people can take up a lot of space. Interesting if someone did do a count. 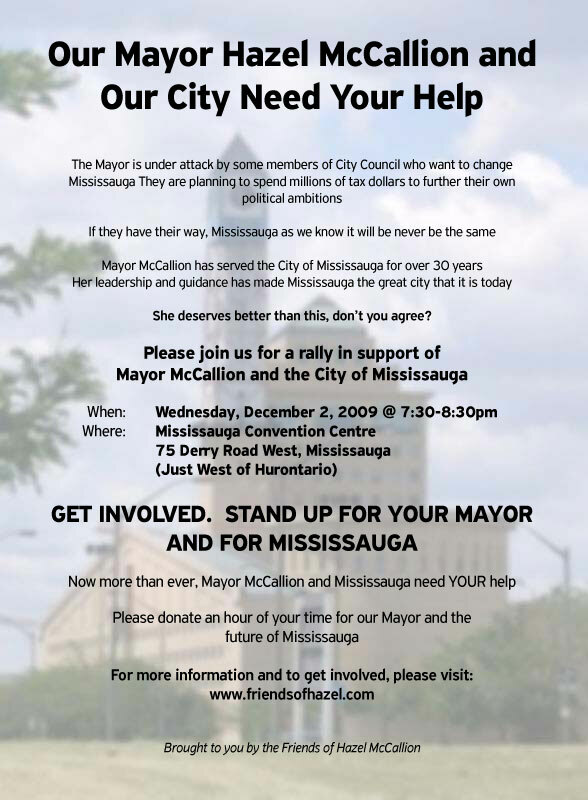 The issue of how many is very important when looking at the whole political future of Mississauga & the 2010 election. Hazel McCallion is called the world Greatest Mayor, that she has 90% of the vote - she should have a very large turn-out in her hour of need. That is in a City noted as the 5th largest in Canada with a population of around 650,000+. This is the downside of low voter turn out. For years, the Mayor got elected by fewer and fewer voters, as low as just less than 20% of cast votes, recently. Many just voted for Hazel McCallion to be on her band wagon Now where are her real supporters? A surprise meeting with Councillor Pat Satio and her husband. She brought her own name tag, the rest of us used the stick on kind. A Port Credit band supplies the tunes. Some before shots. Some fellow showed up with boxes of samosas' that were warmed up and put everywhere. Did I say that I like the chandeliers? Couple pictures to show more chairs being put out as a larger then expected crowd flows in. Maybe some staging with a child and a I love Hazel sign? Lots more pictures to raise suspicions. Interesting choice of reading material, older read the horror story of current events and younger - hunted Canada. Lots of pictures on the two screens. Master of ceremonies - the Mayor's good old friend at the Toronto Sun, Ted Woloshyn. Third picture has a nice room shot for that point in time. Greeting the friends - hugs and kisses to other VIPs. Settled down as the media feeding frenzy still goes on. Couple of young lads at the table - soon replaced. Couple more room shots - with Hazel & crew seated. Uh - oh - looks like Hazel is watching me. In fact at the start one of the persons with the event tried to tell me to get to the media stage at the other end of the room. How things look from the media stage. View from the other side of the room. one of the first developers in what later become Mississauga. I try not to use the flash but very hard to get good pictures of people who are not posing. Dr. Boyd Upper is Mississauga's expert on power plants - Chair, Clear the Air Coalition Mississauga. Even kid power needs a rest. Lots of jokes about the older lady going after the younger man! Don Cherry - man of many jobs. "the greatest mayor in the world". Really odd that he addressed her from the other side of the stage and left that way too. Didn't see him get within 20 feet of the Mayor. Councillors up first to announcement the Mayor will now address the crowd. Hazel and kid power ascent to the stage. An emotional moment and address by the Mayor. Ted gets his hug - have not seen anything yet written by him about this rally. It sounded like the Hazel had a tear in her eye. Hay - the gang is all here! A short video about how I am treated when I go into the danger zone - around Hazel McCallion. To visit the video directly click here. Yes - pictures of empty chairs - should count some time.